The initial segment of METRO light rail service in the Phoenix, Arizona area began operating in December 2008. This first section was 20 miles long, covering a small part of west Mesa, Tempe at the ASU Main Campus, downtown Phoenix and the central corridor of Phoenix. The next segment, extending Mesa access by another 3.1 miles to downtown Mesa, began operating in August 2015. In March 2016, three more miles and three more stations in west Phoenix were added. There are more segments that will be added in the future. If you aren't situated within walking distance of a METRO light rail station, you can drive to a designated parking lot, leave your car and access the system from there. They are called Park and Ride lots. Park and Ride lots have security, but, of course, parking is at your own risk. There are public restrooms at the Sycamore St./Main St. (Mesa) Park and Ride lot. Overnight parking is not permitted at Park and Ride lots. The Park and Rides at the end stations tend to be much busier than those in between. There are times when the end Park and Ride lots fill up. If you are connecting to or from bus routes, know the bus schedules and locations of bus stops in relation to light rail stations so you can make your connections easily. You may also wish to map out alternate routes where possible in case buses or light rail trains run off schedule or break down. Bicyclists may bring their bikes aboard the train. Every light rail car has four slots for bikes to hang by their front tires on racks positioned near the middle of the car. Look for the bicycle symbols on doors nearest the racks. Cyclists may also stand aboard the trains with their bikes if the racks are full. Plan ahead. Know where you're going and be ready to exit the train quickly after arriving at your destination. Trains are only supposed to be at each station for 15 seconds. Using the light rail to get to or from Sky Harbor Airport? The free PHX Sky Train is available at the 44th St. and Washington St. transit center. Some crosswalks are not very close to where you might enter/exit a train. Although it may be tempting, do not cross METRO light rail tracks except at marked crosswalks. Jaywalking across the tracks can result in a citation with a fine that is $150 or more. All METRO light rail passengers must purchase a pass before boarding the train. These passes, except the single ride tickets, may also be used on Valley Metro buses. You may purchase passes online (takes about a week to receive passes), at ​various stores, libraries, and transit centers, and at METRO station fare vending machines. Validate any passes you wish to use immediately (except for single ride) by inserting the passes into the slot marked "Validator"
Passes purchased in advance may be validated by inserting the passes into the slot marked "Validator" on any fare vending machines at all METRO light rail stations or on fare boxes aboard any Valley Metro bus. Passes are good from the dates of validation through the duration of the passes (1-31 days). Fare boxes or vending machines print the expiration date on your pass. If you have a Platinum Pass from your employer or school, tap it on the large orange pad on any fare vending machine available at every light rail station before boarding the train. METRO light rail trains depart stations at each end of the route every 12 minutes from about 6 a.m. to 7 p.m. and every 20 minutes at other times. Trains start running at about 3:30 a.m. weekdays and 4 a.m. weekends and holidays. The last full trip of the day on Monday through Thursday begins at 11 p.m., arriving at the opposite end of the line at about 12:25 a.m. early the next morning. On Friday nights and Saturday nights (Saturday and Sunday mornings) the last full trip is at 2 a.m., arriving at the opposite end of the line at 3:25 a.m. These times are all approximate and are changed slightly from time to time. There are three public restrooms. There is one at the Tempe Transportation Center (5th Street and Forest Avenue), one is at Central Station in downtown Phoenix (Central Avenue and Van Buren Street), and the third is in Mesa at the Sycamore/Main Street Station. If you purchase any pass other than a single ride, you may certainly use these facilities and then get back on the train at no extra charge. Most businesses along the train route restrict the use of their restrooms to paying customers. Water fountains are available on every station platform. Detailed maps of stations and park and ride facilities are usually available on station platforms. Every one of the 32 METRO light rail stations has unique artwork integrated into the design of the platform with an explanatory plaque. For news on delays or upcoming route or schedule changes, listen for announcements at light rail stations or watch the station marquees. There may also be signs at the stations about changes due to special events and there will be announcements available through the local media. METRO Light Rail has a system in place to let passengers on the platform know how long it will be until the next train arrives. 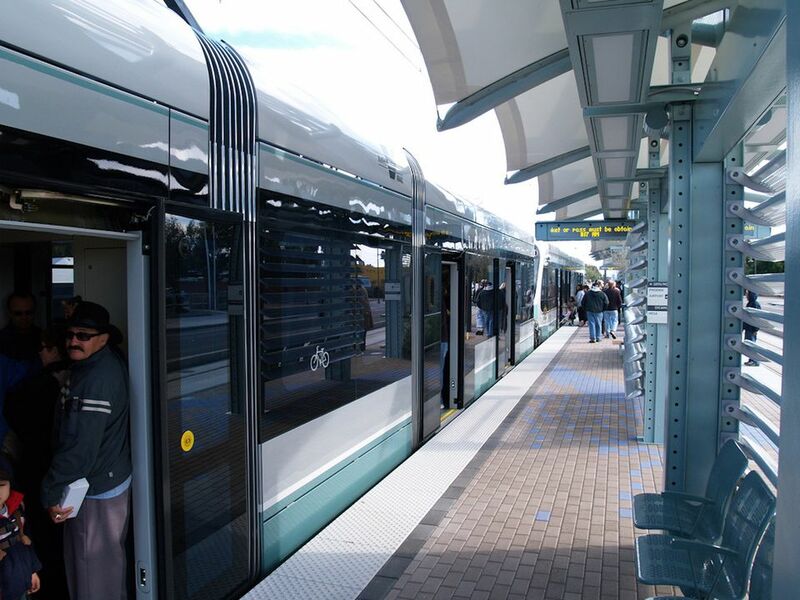 When trains stop, doors will open allowing passengers to exit and board the light rail cars. If the doors don't automatically open, press the large yellow button to open the door you wish to use when the lights on the button turn green. When the doors are about to close, a red light will flash inside the train above the doors to warn passengers to stand back. An announcement that the doors are closing may accompany the flashing lights. You may hear other announcements including those indicating that the train is approaching or arriving at a station and which side of the train (as you face the front) passengers should use to exit on to the station platform. Each METRO light rail car has a posted route map. Not sure about where you're going? Ask your fellow passengers. Chances are a regular rider familiar with the METRO light rail system will be willing to help. Trains can stop and start quickly and unexpectedly. It's safest to sit while riding on METRO light rail. If you must stand, hold on to one of the many grab bars positioned throughout each car. Each METRO light rail car is equipped with sideways facing seats that fold out of the way to accommodate wheelchairs. Passengers sitting in these seats must give up those seats to passengers in wheelchairs. Wheelchairs do not need to be strapped in like they do on buses due to the smoother movements of the trains. Wheelchair users should park their chairs in appropriate spots, then apply their brakes. Bags should either fit on your lap or be able to sit on the floor between your feet and should not be placed on an open seat. If you've put your bike on a rack aboard the train, consider taking it off the rack at the station just before your final stop so you can exit quickly. All riders must have their transit passes accessible at all times. Police officers and transit officials patrol METRO light rail cars at random to survey passengers to make sure they have valid passes. Those that don't face penalties that could include a fine of up to $500. Certain activities are prohibited at METRO light rail stations and on the trains. They include loitering, smoking, eating, drinking, consuming alcoholic beverages or illegal substances, rollerskating, skateboarding, riding bikes, and playing music loudly. If you notice suspicious behavior on board a METRO light rail train, you may alert the driver by pressing the emergency call button on the light rail car or use your cell phone to call Valley Metro at 602-253-5000 extension 0. If you witness illegal activity including tagging (graffiti) on a METRO light rail train and have a cell phone, dial 9-1-1 and be prepared to report details of the crime, perpetrator(s), and where you are to the operator. You may also press the emergency call buttons available on each light rail train to alert the driver to the situation. If an emergency arises at a METRO light rail station or aboard the train, use the red emergency call buttons that are located at every station platform and on every train. Service animals are allowed on the light rail and buses. Pets are allowed if they are in carriers and the carriers are kept closed. Do not trash the trains. There are trash cans available at every METRO light rail station for your convenience. Personal belongings should not be left unattended at any time. METRO light rail cars and stations are equipped with security cameras that run during all hours of light rail operation. To assist passengers getting to and from light rail stations, crosswalks with traffic signals have been installed along the route. Drivers need to be aware of these signals and be prepared to stop for passengers using these crosswalks. Drivers should be prepared to stop quickly around light rail stations to avoid people who are jaywalking (even though they shouldn't be) to get to and from the stations. All four-way intersections along the light rail route are now equipped with left turn traffic control lights. Drivers can, depending upon the intersection, make left turns and U-turns at these intersections when the green arrow is lit. Be aware of signs at individual intersections for restrictions. Drivers in the left turn lanes should not proceed into the intersection if a red arrow is displayed. Drivers should not stop on light rail tracks for any reason. Complete your turn as soon as possible to avoid obstructing the tracks. There have been collisions between trains and motor vehicles for a variety of reasons, and the trains are not able to stop as quickly as other vehicles nor can they swerve out of the way. Be mindful of the curbs separating light rail tracks from streets especially in left turn lanes. The curbs are high enough to be useful as a warning to drivers that they are too close to the tracks, but in many places along the route they are low enough to be jumped by the average passenger car. Cars that jump the curb may become stuck and sustain considerable damage. Pay attention — METRO light rail trains generally run very quietly. They do flash their headlights and sound their horns and/or bells upon approaching or leaving light rail stations and when nearing major intersections. Cross only at marked crosswalks with signals. Be especially patient at four-way intersections as it may take longer to get a walk signal due to the addition of left-turn arrows and light rail signals. Crossing against the walk signs or jaywalking across the tracks on any section of the METRO light rail route may result in fines up over $150 per offense. Pay attention. METRO light rail trains generally run very quietly. They do flash their headlights and sound their horns and/or bells upon approaching or leaving light rail stations and when nearing major intersections. Stay off the station platforms unless you are buying passes, you are taking the train, or you are directed to detour through a station due to sidewalk obstructions. Loitering at a station is not permitted. METRO light rail stations are for the use of passengers only. Do not stand on light rail tracks at any time. Do not place any objects on METRO light rail tracks, including coins. The most confusing issue for people who are not familiar with METRO light rail is the notion that it is a loop and not an end-to-end back and forth trip. The reason this is confusing is that there are five stations in downtown Phoenix, near the middle of the loop, where the trains travel one way only. Those stations are split and the station where trains are going in the other direction is about a block away. The five stations in questions are shown on maps as having two intersections. Use the Van Buren/Central station for northbound, and use the Van Buren/1st Ave. station for southbound/eastbound. Use the Washington/Central station for northbound and use the Jefferson/1st Ave. station for eastbound. Use the 3rd St./Washington station for westbound/northbound and use the 3rd St./Jefferson station for eastbound. Use the 12th St./Washington station for westbound/northbound and use the 12th St./Jefferson station for eastbound. Use the 24th St./Washington station for westbound/northbound and use the 24th St./Jefferson station for eastbound. Here are answers to the most common questions about the METRO light rail. Q. Is it better to buy a single trip ticket or a one-day pass? A. If you're taking a round trip on the train during the same day, you might as well buy a one-day pass. It will cost the same as two single trip tickets, but at least you won't have to stop at the METRO station vending machine again. If you are taking the train and connecting to a bus all within a single day, purchasing an all-day pass is the logical option and will save you money on a round trip. Q. Does the train ever travel underground? A. No, it isn't a subway. The entire trip is above ground on city streets. Q. Can you get electrocuted if you step on the tracks? A. No. The electricity is supplied overhead and not on the rails. However, people should still stay off the tracks and use the crosswalks like they are supposed to. Q. Why aren't there bathrooms on the trains or at the stations? A. The entire trip from end to end should only take about 75 minutes. There's no reason to maintain restrooms on this system. Q. How do you get to Sky Harbor Airport on METRO light rail? A. The train doesn't actually stop at the airport. You have to get off METRO light rail at 44th Street and Washington, and then take a free airport people mover, PHX Sky Train, to the terminals. Ridin' the Rails: How Much Does It Cost to Ride the Train in Phoenix? How Long Does it Take to Get From Here to There During Rush Hour? Need a Big Box of Something? Find the Nearest Costco! Free Shuttle to Spring Training Baseball Games!